This is my entry to this week's Daily Paintworks challenge, set up by Kelley McDonald. I couldn't resist adding the paperbag. 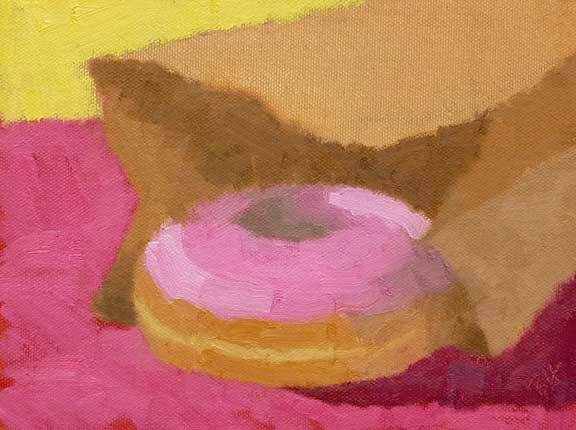 And I promised to take the painting to my local Dunkin Donuts to show them the result of their care in packaging it all up for me. Fun! I've put this painting in an auction on the DPW site. Here's the challenge page if you are interested. Click on my painting for the details. It was 70 degrees today and sunny. What a day to paint outside! Now that spring is around the corner I'm starting to get used to the bare trees, and I'd like to master them before the leaves come. So here's another one. This is my first painting on a Raymar linen panel (not toned). I loved it. It was great to be out last Wednesday, just in time to catch some of the snow before it all melted. 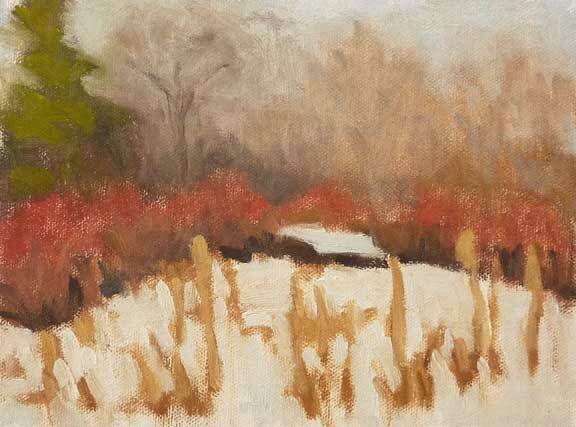 I love the way last year's cattails pop up through the snow. 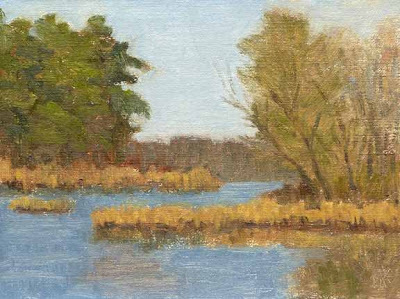 This was painted in the marsh alongside the Bruce Freeman Rail Trail in Chelmsford, MA, a really nice place for a walk. My first thought was to leave the painting as it was painted (above), but my desire to improve the background trees got the best of me. And guess what? I don't like the newer version as well. Lesson learned. 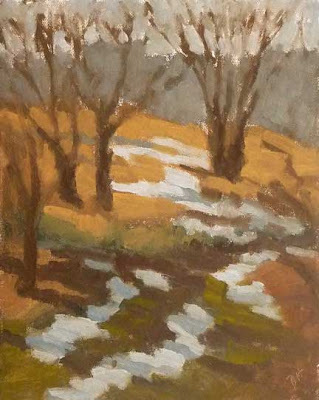 This is my second plein air painting this year, done on February 22. There I was, standing in the mud, loving every minute of it. Please join us on Saturday from 4-6 PM at the Yarmouth Frameshop and Gallery for the artist's talk on our French Show which opened in February. Joelle, Suzanne, Kitty, and I will all be there.